My Mirrors are Fine, right? Most likely, no, your mirrors are not fine. After looking at the mirror settings of several Wings at a recent meeting, I noticed that most riders have their mirrors adjusted so that both side mirrors have a predominant view of the rider’s elbows, and the lane behind the bike. 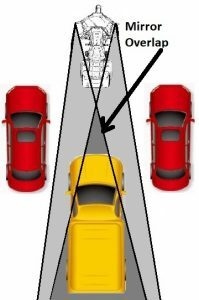 That minimizes the coverage of the adjacent lanes, allowing vehicles to hide in blind spots. It also wastes a lot of mirror coverage by overlapping the view of the two mirrors covering the same area. By setting your mirrors properly, you can minimize the amount of overlap, and maximize the amount of coverage. We should all be doing a head check before changing lanes, but knowing ahead of time that a vehicle is there is much safer. Try setting your mirrors this way. Park your bike on a side street about 15–20 feet in front of a parked vehicle. Place yourself in your normal riding position and check the view in your left mirror. Keep adjusting your left mirror out until you can see just your hand in the mirror and about half of the car behind you. Then do the same with your right mirror. Now, take a ride in traffic and see if you don’t have much better visibility of traffic in the adjacent lanes. 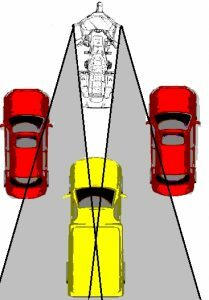 Vehicles that were previously in your blind spots will be clearly visible. A vehicle in the lane behind you will be visible in both mirrors. This approach can also be used in four-wheelers. Start by adjusting your inside mirror to display the full view of the lane behind you. Now note the item (a tree, bush, sign or whatever) at the very left edge of the view in your rearview mirror. Then adjust your left outside mirror so that same item is at the right edge of the outside mirror image. This gives you a much wider range of view using those two mirrors. 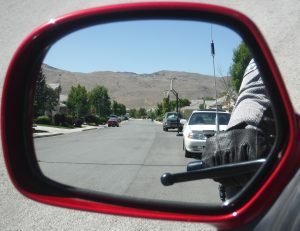 Repeat the process in your right outside mirror and you’ll have the maximum coverage your mirrors can provide. But, still remember to make that head check …. Posted 02/04/2019 by staff & filed under Safety, Tech.